Our vision is for every individual, anywhere in the world, to be able to immediately improve their own lives by transforming lost and wasted fidgeting behaviors into productive, satisfying Squidgeting! Our goal is to give them the tool that allows them to properly reclaim what too often has been a lost sense of self-worth and dignity. Squidget’s mission is to provide everyone who fidgets (and almost everyone does) with a research based device that is safe, affordable, durable and discrete. 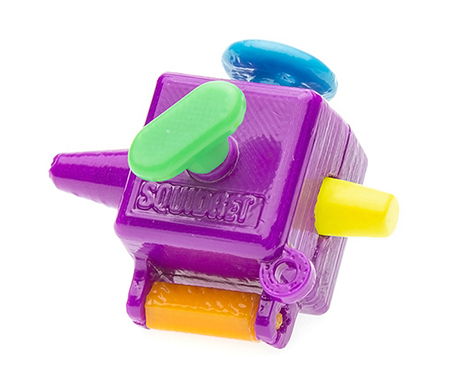 The Squidget device provides all of that, PLUS a very satisfying and enjoyable alternative to their existing disruptive or potentially self-harming fidgeting behaviors. “Team Squidget” is composed of experts in the fields of Neuro-Psychiatry, Neurosurgery, Special Education, Medicine, Clinical & Therapeutic Specialties, and University Academics. All of these experts have invested their experience and world-class expertise because they are eager to have Squidgets, not only for use by their own clients but to dramatically enhance the quality of life for others. The first Squidget was created by Naomi Cher, to help a friend who struggled with severe anxiety. Her friend would dig her fingernails deep into her arm, resulting in harmful scratching and even breaking the skin. So, to help her friend, Naomi ‘holed up’ in her family’s home one weekend and created the very first version of Squidget using clay and jewelry accessories. Naomi’s friend’s impulses were now re-directed to the Squidget’s surface with deep ridges, allowing her to dig her nails into the grooves instead of her arm and thus helping to reduce her anxiety. Naomi and Jerry Snee, Jr. met in 2009 and formed Squidget Company, Inc. in order to meet what they knew would ultimately be the ever-growing demand for Squidgets. So together they focused solely on creating a device for individuals, from all walks of life, who needed to transform their own disruptive or self-harming fidgeting habits into much more productive and effective Squidgeting. Since then, numerous amazing heroes have stepped forward to join Team Squidget to help achieve our mission.